For the second in our series of co-commissioned articles looking at visual arts projects supported by the Digital R&D Fund for the Arts, Alastair Eilbeck of MeYouAndUs explains the thinking behind TILO – a display system for arts venues that aims to create and reflect the 'digital soul' of a building. When is a video screen not just a video screen? For media artist Alastair Eilbeck the answer’s simple ­– when it’s TILO. Described as a ‘hybrid display system for arts and culture venues’, TILO – named after an African god of creativity – is the brainchild of Eilbeck and fellow artist James Bailey, collectively known as MeYouAndUs. This Digital R&D Fund for the Arts project draws on the pair’s experience of creating interactive, participatory public art events, and explores how to integrate this approach into the fabric of an arts building. With technology partners Amaze and Pixel Inspiration, and research partners Creative Exchange at Lancaster University, the year-long pilot period has seen screens installed at FACT in Liverpool and Phoenix, Leicester. What that means in practice is something that, at first glance, looks just like a set of digital flatscreen monitors. And on one level, that’s precisely what it is. But TILO isn’t about the hardware – it’s the tech behind it in the form of sensors and live data feeds that’s important. 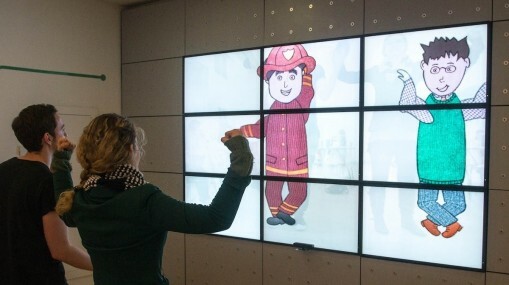 This turns the screens into something that can record, reflect and interact with the people visiting and using an arts venue. By doing this, says Eilbeck, the idea is to create and reflect the ‘digital soul’ of a building by producing a digital footprint for a physical space. Although currently operating in two venues, Eilbeck would like to see screens in at least 10 UK-wide arts organisatins in order to ensure the system’s long-term viability. Through several projects at the pilot venues, MeYouAndUs have demonstrated how TILO can have a dual role as a tool for communicating information about what’s going on in a building, and as a way to develop a lively and fun relationship with the people visiting it. A TILO project at FACT involved MeYouAndUs producing a work called The Photo Emoticon. Using a hand scanner as a way to engage people with the system and collect anonymous marks from them, visitors to the Liverpool arts venue were asked where they were going in FACT and to pick an appropriate Skype emoticon to describe their mood. When they submitted their answers, this would in turn draw down images from a Flickr group tagged using the same emoticons – so for example, if the visitor had picked a tongue-out emoticon to reflect their mood, TILO showed a series of images of people with their tongues out. At Phoenix, this summer’s When I Grow Up incorporated the work of children’s illustrator Maria Pearson, who the pair had worked with on a previous project for Salford University. Utilising body skeleton mapping technology, children visiting the venue stood in front of a TILO screen while a gallery assistant with an iPad asked a series of questions, the aim being to establish a simple statement such as: ‘My name’s John, I’m nine-years-old and when I grow up I want to be an astronaut’. The children would then be able to make their own character, using Pearson’s illustrations to choose hair colour and style, eyes, face, etc. Around 200 children took part. While up to now art projects have been specific to each of the venues, with a much bigger network of organisations there is the potential to create a single piece of work that engages and animates people in different ways, depending on the unique context of each building it is shown in. And, says Eilbeck, the bigger the network the more scope there is to fund new work by other artists. It’s an exciting prospect, believes Eilbeck – although he is realistic about the work that still needs to be done for the system to become commonplace.